I rarely fall in love with a place right away. I take comfort in the familiar, and travel to any new location makes me feel out of sorts, at least for awhile. But I fell in love with Scotland the minute I set foot in it. There’s a beauty in the rolling hills, soaring mountains and sparkling lochs. It was after dark when we arrived in Edinburgh, but we still got a good sense of the city driving around. Unfortunately, it was the time of night when all the pubs have closed their kitchens, so we had a time finding somewhere other than a Mcdonald’s to eat. We eventually located a fabulous Italian restaurant and enjoyed some Scottish hospitality. The next morning we started with a full breakfast spread and finally got to try haggis. It was nothing at all like what I expected, and it actually tastes pretty good. My husband loves it! We planned to start the day with the National Musuem of Scotland, but we had to kill some time before it opened. We drove downtown, found a parking space, and took a little wander. 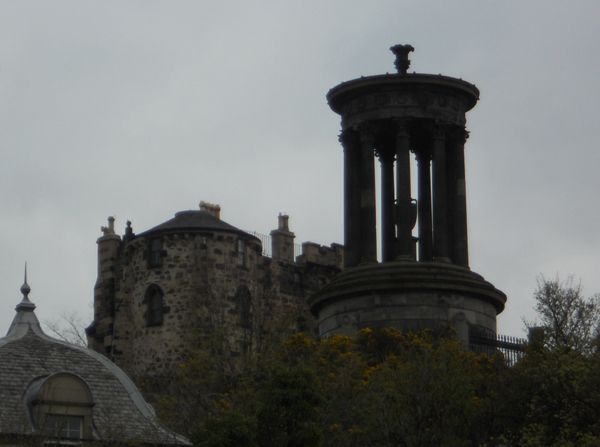 There are tons of amazing buildings and monuments to see in Edinburgh and we were only able to explore a fraction of them. The first thing to catch our eye was an interesting monument on the city’s Princes Street, dedicated to Sir Walter Scott for the Waverley Novels. It’s an impressive piece of architecture that caught our eyes from across a bridge. 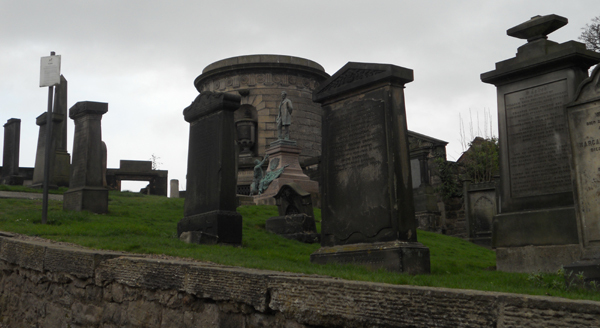 We wandered along the base of Calton Hill and took pictures of the monuments above. (It wasn’t until our return to Edinburgh several months later that we identified what each was for). The hill overlooks several notable buildings within t he city, including both the Scottish Parliament Building and Holyrood Palace, which are located near the foot of the hill. Beyond the monuments above lies an impressive mountain. Our path took us past several impressive government buildings. The UK government’s Scottish office includes an impressive mural above the door. 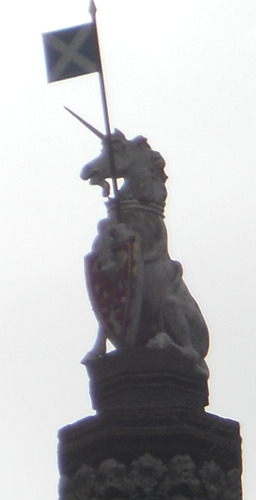 (I have a minor obsession with the Lion and the Unicorn). Eventually our wandering led us to an impressive graveyard. 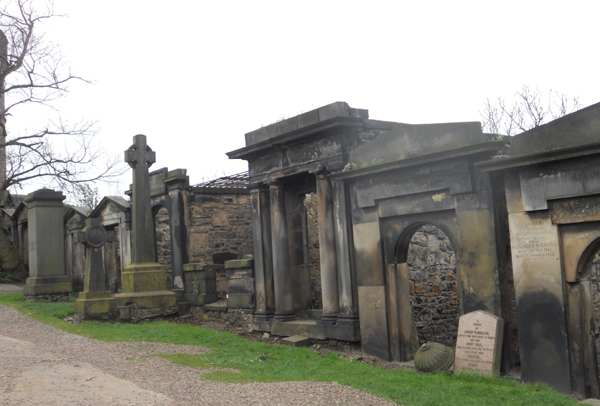 We learned later it was Old Calton Burial Ground, a famous historical graveyard and resting place of several notable Scots. The burial ground was first opened in 1718. In 1819 it was altered to allow a road to cut through. Notable people buried within include philosopher David Hume and rival publishers William Blackwood and Archibald Constable. The graveyard also includes a Scottish American monument dedicated to those who died during the American Civil War. 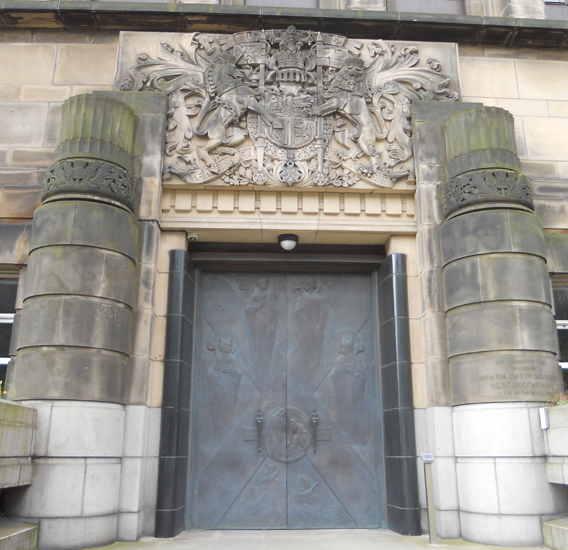 With our curiosity satisfied, we retraced our steps to the National Scottish Museum. But that’s a story for another blog.